(1) Click the Register / Login link at the top right side of our site. (2) Click the REGISTER button to set up your account. Click the Register / Login link at the top right hand side of our site. Under the login box you'll see a link that says Forgot your password? That link will send an email to you with your password. How do I find my products? (1) use the quick search drop-down menu of our website to find your projector / TV Lamp / Battery Grip model no. (2) use the quick search drop-down menu of our website to find your projector / TV Lamp / Battery Grip original PN. (3) type a keyword, model no or PN into the SEARCH box directly. If you have any trouble locating a product, feel free to click the Contact Us for assistance. PureGlare does not accept order or payment by phone. You must place your order and checkout online. Please Note: Shipping and handling are non-refundable. Your credit card will be charged at the time of your purchase. Do you ship to the country outside of Australia? According to Australia Taxation Law, exports of goods and services from Australia are generally GST-free. For customers outside Australia, to ensure you are eligible for GST exemption online, both your Billing Address and Shipping Address must be valid addresses in overseas country. (1) Copy of the front and back of credit card. (2) Copy of a photo ID. (3) A statement reading "I authorise Pureglare to ship my order to the following (shipping) address, followed by the account address. Then Fax to us (Fax: 02 9644 6412). (1) Fax your purchase order to (02) 9644 6412 OR email your purchase order to sale@pureglare.com.au. (2) The purchase order must be your official form and must be signed. (3) Please include your purchase officer Name (printed) and contact Email Address. (4) We will ship the goods to you with an invoice. Invoice is due upon receipt of goods. Please pay promptly. Note: We will create an account for you in our system and email you the order confirmation, processing status and shipping tracking number. Click the My Account link at the top right hand side of our site to check your orders status. You can use your consignment note number to track your freight online from the Track & Trace. I need a copy of my receipt / tax invoice. Click the My Account link at the top right hand side of our site to print tax invoices. Click the My Account link at the top right hand side of our site to review your orders. You may compare your order history on our website, with your financial records. If you have further questions or concerns, please Contact Us for further assistance. My order never arrived / An item is missing from my shipment / My product is missing parts. Click the My Account link at the top right hand side of our site to track your order status. Be sure that all of the items in your order have shipped already. If you order displays your Package Tracking Numbers, check with the shipper to confirm that your packages were delivered. If your packages each show a status of "delivered", please Contact Us for assistance. PureGlare has been a supplier of replacement projector and TV lamps to the world wide for over 20 years. Our online shopping has allowed people to search for projector lamps and compare lamp prices across a variety of stores, but it is important to know exactly what you are comparing. We have written this section to help explain the difference varieties of genuine lamp modules, bare bulbs, original bulb inside lamp modules and compatible / generic bulb inside lamp modules. If you own a multimedia LCD or DLP projector, you may have to replace the projector's lamp when it has stopped functioning. The average projector lamp's bulb lasts for around 2,000 hours, so most projector users will need to replace their lamp at least twice over the lifetime of the projector. Since projector lamps can be expensive, it is important that you have the most accurate and up to date information about projector and TV lamps before you buy. There are four major components for a complete lamp module, which includes burner, reflector, plastic module housing (often called a cage) and power connector, all of which are important parts to understand when purchasing a projector lamp. Some companies do not sell the complete lamp module which can cause frustration and confusion for customers. Such as the bare lamp, this includes a burner and reflector at a basic level. A long lasting and well-performing lamp requires a good quality burner and reflector. But most importantly, adequate cooling makes a big difference for the lifespan of the lamp. For instance, operating a projector / TV in a hot, humid or poorly ventilated environment can shorten the lifespan of the lamp. For some projectors, this is even more of a concern, such as compact or portable projectors, as they are more physically compact and therefore have poorer heat dissipation properties. Therefore, always check the cooling fan and air filter when you replace the lamp. Keep in mind that the cooling capability of the projector / TV will diminish over time with usage, cooling fans will wear if not serviced (ie. re-oiled, cleaned or replaced), and an unfunctional air filter can block the air flow. You also need to clean the lamp cabinet as the built-up dust can trap heat inside the projector / TV. A projector lamp contains several components: the ARC tube, ultra-high pressurized mercury vapor, electrical wiring, a quartz globe or reflector, a fastener, a spoke, a bolt, a screw and finally the black plastic housing itself. ARC Tube - The ARC tube is a component made of blown quartz measuring about 2 inches in length that located at the base of the quartz globe. The ARC tube is positioned by highly-accurate machines and set with extra strength plaster. Mercury Vapor - The mercury vapor inside most projector lamp ARC tubes is ultra-high pressurized. The mercury vapor is sensitive to the amount of current running through therefore it is needed for projectors to have electrical ballasts inside them to regulate electricity flow. The ballasts ignite the mercury vapor at a high voltage and then bring the voltage level down to the appropriate running voltage required to operate the projector lamp. 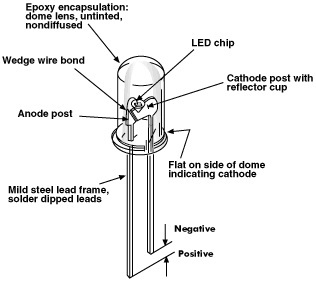 Electrical Wiring - The electrical wiring on a projector lamp is fused inside the quartz ARC tube and runs out the top of the tube through the side of the reflector. Electricity, regulated by the ballast, runs in a circuit from the back of the projector lamp through the side and back into the projector. 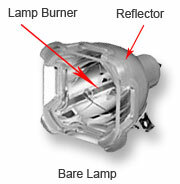 Quartz Globe reflector - The quartz globe or reflector is the hard exterior skeleton of a projector lamp. The quartz globe is usually lined with a highly reflective metal material on the inside in order to reflect the light generated by the ignition of the mercury vapor inside the ARC tube. The quartz globe also holds the ARC tube in place and is usually filled with extra strength caulking to seal it in its base. Plastic Housing - The plastic housing is the piece of moulded plastic that holds the projector lamp in place when it is sitting inside the projector. 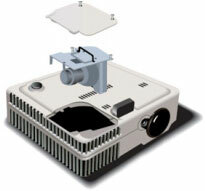 Projector lamps are usually locked into the plastic housing using a retaining clip. The attached wiring easily screws into a slot at the back of the plastic housing. For more information about projector lamps, please do not hesitate to Contact Us. A projector lamp operates by sending an electrical current across an ARC gap that is full of ultra-high pressurized mercury vapour. The electricity lights the mercury vapour which then causes the lamp to emit a light with an extreme intensity or brightness. The bright light created by this process shines onto an LCD (Liquid Crystal Display) or DLP panel which then in turn produces the fantastic images projectors are known for. Projector lamps are produced by a extremely complex technology that is very costly to manufacturer, therefore the price of projector lamps tends to be pretty high. What are bare lamps for projector / TV? We sell projector lamps in two formats. 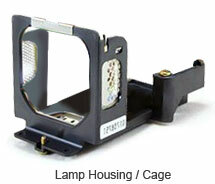 The standard format is with the projector lamp encased in a high-temperature resistant black plastic cage / housing. But, we also sell just the bare projector lamp alone. More than 97% of our lamps are with HOUSING. Purchasing the lamps with housing will have less hassle for installation. The primary reason people consider changing the bulb without the housing is to reduce cost. But as the prices of lamps have dropped, the difference in price between the bare lamp and the lamp with housing is not as much as in the past. It often requires skills and experiences to install the bare lamp into your existing housing. And also, your existing housing must be in a good re-useable condition. It can be a very good solution when the completed lamp module (with housing) is no longer available on the market. If you purchase our bare lamp and you don't want to take a risk to install it yourself, you can send your existing cage / housing to us. We will install it for you for no extra charge. You will need to make usre that your existing housing is in good re-useable condition. What are compatible projector / TV lamps? One of the main areas of confusion, when buying a replacement projector lamp, is over the authenticity of the lamp and how to tell whether the lamp is genuine or not. Recent changes in the projector and TV lamp market, in the last few years, allow you to have a number of different options available to you, when it is time to replace your DLP television or multimedia projector lamp. You can now choose between a projector lamp made by the original manufacturer, or a cost effective lamp that is compatible with original manufacturers’ lamps from PureGlare. We will help you differentiate between the trusted compatible lamp bulbs available from PureGlare and the counterfeit options represented by our competitors. We are dedicated in helping you avoid buying an inferior, counterfeit, or incompatible lamp for your projector or TV. What are "original bulb inside" projector / TV lamps? Lamp modules with 'Original bulb inside' are assembled with genuine original bulbs (Philips, Osram, Ushio, etc. bulb inside) and tailor-made, custom-designed housings. 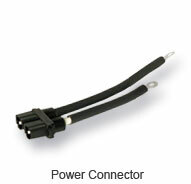 They have the equivalent performance of the original with the best performance ratio over price and quality. Where is my projector lamp located? The lamp is the heart of any projector; it shines light through a DLP or LCD system so that the projector lamp can display its beautiful images. The projector lamp can be found by locating a square or rectangle plastic plate on the outer shell of the projector, the plate is usually on the bottom of the projector but can sometimes be found on the top or sides. The covering is often secured in place by two screws. Undoing the two screws and lifting the plate off, will reveal the bottom of the plastic housing that holds the projector lamp in place in your projector. The plastic housing usually has a handle attached to it. Pulling the handle gently will remove the projector lamp and housing from the projector. A screwdriver and a pair of clean gloves are all you will need in order to install your brand new projector / TV bare lamp. (1) Turn off and unplug the projector / TV. (2) Allow the device to cool down. It could take anywhere from 30 to 45 minutes for the projector / TV to cool down completely. Then remove any dust on the outside casing with a soft, dry, and clean cloth. This will ensure that dust does not enter into the machine and get onto the vulnerable interior parts. (3) Remove the old lamp module from the projector / TV. (4) Open the lamp housing to gain access to the old bulb. (5) Clean the dust off the housing and make sure it is free of any debris. (6) Unscrew the wires that are connected to the bulb and connector. Remember the wiring of the strings. (7) Remove the retaining clips and screws that are holding the old bulb in place. (8) Replace the old bulb with the new bulb. Fasten the clips and screws back into place. Please wear a pair of clean gloves or get a paper towel to handle the new bulb. You must do this without touching the bulb with your bare hands. Any amount of bodily/skin oil will cause problems very soon. It is well known that a majority of multimedia projectors / TVs have replaceable lamps that can be easily replaced in case they stop functioning. (1) Make sure that your power switch is off and that the power cord is unplugged from the electrical socket. It is also wise to unplug any other cables and label them in order to restore them in the right way once the lamp is replaced. Allow the projector / TV to cool down for at least 30 minutes. (2) In order to see the lamp, remove the access handle on the outside cover. You may need to use a screwdriver. (3) Pull out the used lamp and clean the relevant parts using micro fiber products and not paper. Please note that in some projectors a small inside filter should also be replaced. (4) Insert the new lamp into the projector carefully avoiding touching the glass of the lamp itself and any other galss surface. Touching the lamp will deposit skin oil that will likely cause the overheat destabilised in the spot where it was touched. It will cause the lamp to explode or prematurely fail. (5) Reassemble the access panel, reconnect the cables and power up the projector. (6) Reset lamp (clear lamp hour meter) to clear the remaining lamp time and the lamp hour meter. The projector has a built-in counter which keeps track of the lamp operating time. When the cumulative operating time reaches a certain point, it causes the replacement warning message to be displayed. Therefore, the counter needs to be reset after the lamp has been replaced with a new one. You can do this using the menu displayed on screen. For some model of the projector, you must complete lamp reset within 10 minutes of switching power ON, otherwise, the projector turns itself off automatically. For some model of the projector, when the lamp exceeds the limit hours of service, the projector cannot turn on and the menu is not displayed. If this happens, you need to find out the information in your user manual to clear the lamp hour meter by using remote control or pressing the multiple combination buttons on machine. When the lamp time clock is reset to zero, the lamp indicator goes out. Do not reset the lamp timer without replacing the lamp. Do not use it longer when a warning message is displayed as the lamp could explode. Reset the lamp timer always when replacing the lamp. The message functions will not operate properly if the lamp timer is not reset correctly. You may have heard about projector lamp or bulb refurbishment. Although on the surface this can appear a cheap way to replace your projector's lamp, you should be aware of the dangers of doing this. PureGlare Australia strongly advises against projector or TV lamp refurbishment due to the risks to hardware and personal safety. How long should my projector lamp last for? All projector lamps have an expected operating time, called lamp life. This value is expressed in numbers of hours, and is typically around 1,500 to 2,000 hours. Newer models claim 5,000 hours of lamp life and more. An individual lamp's light output duration is based on a bell curve, so that a majority of (but not all) lamps will meet the lamp life hours specified. Most manufacturers provide a warranty covering their lamps for a certain number of hours or period of time. How can I preserve my projectors performance? It is very important allow your projector to cool down sufficiently before unplugging it. This will prolong the life of your lamp and prevent the loss of your lamp or projector from overheating. Please allow your projector to cool off properly after use. It is also of high importance to keep the filter clean and all air vents and openings clear of dust and lint. Make sure that the projector has enough "breathing room" with adequate ventilation, so that the unit doesn't overheat, putting extra pressure on the motor and the lamp. How can you prevent over heating? Never operate the halogen lamp above the rated operating temperature. The seal temperature should always be maintained below 350°C and the bulb temperature should be kept between 250°C and 550°C. Make sure that the cooling system is functioning properly. Do not allow one lamp to directly expose another. If a reflector is being used make sure that the IR is not reflected back into the filament or into its support. Finally, make sure that particles do not fall on the lamp. How can I Extend My Projector Lamp Life? Projector lamp lives are influenced by several factors. The most damaging factor affecting lamp life is the overheating during their regular performing. Here are some practical advices that will help to extend your projector lamp life and avoid overheating. The most important in extending your projector lamp normal operation is to mount your projector in a space with ample ventilation. It is well known that projectors that are mounted in corners, or extremely close vicinity to the ceiling or in rooms with little air flow, are doomed to expire earlier. Gathering of dust inside your projector can cause the projector lamp to burn at a over nominal temperature, which will cut its life short. Please take care to vacuum your projector and blow the dust out with compressed air on a regular basis depending also on the projector usage. Almost every projector is equipped with a filter that prevents dust from getting inside the sensitive circuitry. During time, the filter gets clogged with dust and it can cause the projector lamp to burn at a hotter temperature than required and diminish its lamp life. The filter on your projector is usually found behind a small rectangular panel that measures 0.5" by 6" long. Please clean the filter or if necessarily replace it with a new one. Turning your projector on and off quickly can have devastating effects on your projector lamp. Projector lamps typically take about a minute before they are running at a stable current. Projectors have special ballasts inside them that ignite projector lamps at a high voltage and then run them at a low voltage. If you turn your projector on and off quickly it can cause the ultra-high pressurized mercury vapor to become destabilized, which will in turn cause your projector lamp to fail permanently. The modern projectors have two modes of operation: normal mode and economy mode. Economy mode usually makes the projector lamp emit a slightly lower brightness level and therefore can extend the projector lamp's life. If you are not sure if your projector has economy mode, please reference to your projector's manual or contact the manufacturer. LED stands for light-emitting diode. LEDs are small light sources that become illuminated by the movement of electrons through a semiconductor material. LEDs have been around for many years and have been used in a variety of applications. 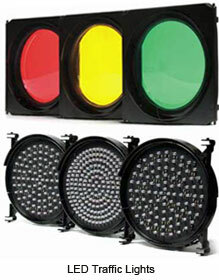 LED traffic lights are used widely in Australia and most of us still use a remote control with an infra-red LED as the transmitter. What is an LED globe? LED globes are designed to replace traditional bulbs and fluorescent tubes by combining multiple light-emitting diodes (LEDs) to create an energy-efficient and cost-saving source of light. What are the benefits of switching to LED globes? 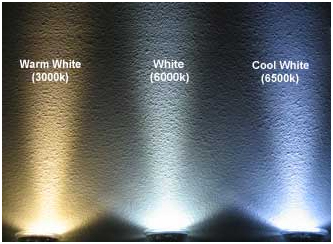 LED lights generate very little heat. They are ideal for kitchens, dens, offices, or anywhere you are working in close proximity to a standard light bulb. Will they fit my existing light fittings? LEDs can be retro-actively fitted to virtually any traditional light fitting. That means overhauling your entire home or office is a relatively simple procedure. They can also be applied creatively as accent lighting and can be used to illuminate feature furnishings in the home or office. The E27 base (sometimes called a Medium Edison Screw fitting) is the most common found bulb base. This base applies to most all standard screw in lighting outlets. The B22 base (sometimes called a Bayonet fitting) is widely used in homes. Though size may vary slightly Tube bulbs all look very similar. This base is typically found on T12 38.1mm (12 / 8 inch) diameter, T10 31.8mm (10 / 8 inch) diameter, T8 26mm (1 inch) diameter, T5 16mm (5 / 8 inch) diameter and T4 12.7mm (4 / 8 inch) diameter Tube bulbs. A slightly smaller version of the Edison Screw (sometimes called a Small Edison Screw fitting) primary associated with Candle or decorative bulbs found in chandeliers and designer lighting fixtures. Twist in bases are common with track lighting and display lighting. Usually associated with smaller compact but yet bright little bulbs usually found in retail display areas. Two prong plug in base is usually the alternative to the Twist in base found on very similar bulbs. Both are common base options on M16 bulbs. What colours can LEDs emit? LEDs are generally monochromatic meaning they emit only one colour. Light colour is associated with the light wavelength. LEDs made with different semiconductor materials emit lights in different wavelengths. LED light wavelengths range from 400 nanometres (blue) to 800 nanometres (red). Popular colours available include warm white, cool white or natural white. What types of LED products are currently available? BULBS: LED light bulbs possess truly superb lighting quality and are an outstandingly efficient replacement for traditional 25W, 40W, 50W and 60W incandescent bulbs. DOWNLIGHTS: Featuring 100% aluminium housing and containing no hazardous materials, these downlights project a warm white colour and boast a lifetime of up to 30 years. FLOODLIGHTS: LED floodlights operate efficiently and save power by reducing maintenance and service costs due to their long life. Save between 60%-80% on your electricity costs in comparison with high pressure sodium lamps. HIGH BAY: LED high bays are 75% more energy efficient and eliminate on-going maintenance costs, making them a cost effective and eco-friendly lighting solution. They can be used as a low power replacement for the 500W conventional mercury vapour high bays. SPOTLIGHTS: The narrow bulbs use only 9W of energy to replace a 50W incandescent bulb and last 10x longer (up to 50, 000 hours). These bulbs provide warm white light and excellent colour rendition and are the most environmentally friendly lighting solution available today. Ideal for the home or office. TUBE LIGHTS are designed to replace standard fluorescent tubes. They emit a cool white light whilst also reducing power consumption which in turn, saves money. The physical glass tube used in traditional fluorescent tubes has been replaced by a more robust plastic composition making these LED tubes considerably safer. 9W LED tubes replace 18W standard fluorescents and 18W LED tubes replace 36W standard fluorescents and are available in both 600mm and 1200mm lengths. Yes. However, not all bulbs are dimmable, and therefore, you can only use bulbs that are designed to be dimmed in a dimmable fixture. Will the bulbs come on immediately, or will they have to "warm up" like the older energy saving bulbs do? LED lights come on instantly. That means absolutely no warming up required. Furthermore, turning the LED light on and off does not decrease its lifespan. What's this I hear about a government phase-out of incandescent globes? The Australian government is gradually phasing-out all inefficient incandescent light bulbs. The phase-out will deliver considerable savings to the environment and the economy. Across the country, the move to more efficient lighting, such as LEDs, is expected to save around 30 terawatt hours of electricity and 28 million tonnes of greenhouse gas emissions between 2008 and 2020. How can I be eligible for refund, exchange or warranty claim? PureGlare provides a full 180-day warranty on all projector / TV lamp modules (with housing), a full 90-day warranty on all projector / TV bare lamps (without housing) and 12-month warranty on all LED lamps / bulbs for faults due to defective materials or workmanship. The warranty period starts from the date of the original purchase tax invoice. Rather than wait for the manufacturer to process the return, we will do everything we can to get you a new working lamp quickly, to minimize your waiting time. Please read our Exchange, Warranty & Refund Policy carefully before you return the goods. Please note if the product is deemed NO FAULT FOUND for any warranty claim, a service fee up to $50 with any additional shipping charges will be applied; and any inspection / rejection fees by the relevant authorized service centre may also be applied. How to request exchange, refund or make a warranty claim? A return authorization form (RA Form) is required for all returns. Any omissions on RA form, or uncompleted fault descriptions may result in delays. Please review our Return Policy prior to submitting your request. Normally, we will send out the item or refund after we receive the returned item, it may take several days. (1) Login and review your order list. (2) Click the order number and review the detail to make sure you want to request exchange / refund. (3) Click "Exchange/Refund/Return Items" button and fill out request form. (4) Once your request is accepted, we will issue an RA form for you to attach with the items to return. I received the wrong product or damaged product in transit. We ask that you inspect your lamp as soon as you receive it. If you find any damage during the shipping process or If you feel that you have received the wrong product, please contact us within 72 hours of receiving the product by selecting original order from your order history and filling out online form by click here. In some circumstances (at the discretion of our Customer Service team), we are happy to offer our consumers with a conditional courtesy return if consumers want to exchange their incorrectly purchased products. • Consumers must notify PureGlare within the first 7 days of having received the product. • The product must not be opened or used, and must still be in pristine condition. • Minimum restocking fee will be 20% of the purchase price (to cover costs and any price reduction we need to offer to move the part). • PureGlare may reject the return after inspection of the condition of the products, and it'll be returned to the customer at their expense. Please lodge a Warranty/Return request after logging into your PureGlare account to request this by click here - the team will be in touch to let you know if they can accommodate the request. PureGlare do not take responsibility for any damage or lost in transit when customer sends the product back to us for warranty or return, and also the warranty could be voided if the product is damaged in transit. So please ensure there is sufficient packaging to protect the product whilst in transit back to us. Any refund (due to cancellation/modification of an order, warranty claim etc.) will be given to the customer via the same payment method the customer used to make the original payment. Please note that refunds can take up to 10 business days to process, but are typically done within 3-5 working days. In some circumstances a consumer may only be entitled to a partial refund, for example, where the fault was not brought to the attention of the trader within a reasonable amount of time after the fault was discovered. If the consumer has already had a reasonable amount of use from the goods, there may only be a partial refund. Refund will be less the original shipping charges associated with the products. If shipping charges were free, $15 will be less for each delivery. The warranties hereby conferred do not extend to, and exclude, any costs associated with the installation, de-installation or re-installation of a product, and any other ancillary activities. • The UHP projector/tv lamp module (with housing) warranty period begins from the date of the original purchase tax invoice and it then lasts for 180 days. • The UHP projector/tv bare lamp (without housing) warranty period begins from the date of the original purchase tax invoice and it then lasts for 90 days. • The LED lamp/bulb warranty period begins from the date of the original puerchase tax invoice and it then lasts for 12 months. (1) Report the details of the faults soon after they occur and send or take the goods back to PureGlare Australia as soon as possible. (2) State what remedy you would like. (3) Provide proof of purchase when returning the goods. (4) Be sure that you did not cause the fault. (5) Stop using the faulty item. (6) Make sure you care for the goods while in possession. (7) Not affected by being used in an abnormal way. Such a use may be noted in the warranty as rendering it void, or it may be a use that you wouldn't reasonably expect the product to perform. (8) Not disposed of, lost or destroyed. In other words, there needs to be proof that the product has failed. (9) Not reduced in value by delay on the goods. (10) To obtain a refund the consumer should return the goods within a reasonable time. (11) Refund will be less the original shipping charges associated with the products. If shipping charges were free, $15 will be deducted for each delivery. Shipping is classified by the ACCC as a service that is non-refundable as it would have been already used / consumed at the time of refund. (12) A 10-20% restocking fee will apply. (12) In some circumstances a consumer may only be entitled to a partial refund, such as, where the fault was not brought to the attention of the trader within a reasonable period after the fault was discovered, or the consumer has already had a certain amount of use of the goods. (13) Any refund will be given to the customer via the same payment method the customer used to make the original payment. (1) Simply you have changed your mind, found it cheaper somewhere else, have bought a gift that is unsuitable, or the circumstances have changed and you no longer require the goods, decided you did not like the purchase or had no use for it. (2) Affected by being used in an abnormal way. Such a use may be noted in the warranty as rendering it void, or it may be a use that you wouldn't reasonably expect the product to perform. (3) Are unable to provide the proof of purchase. (4) Are responsible for damaging the goods by not following the instructions, or misusing the product. Please note if the product is deemed NO FAULT FOUND for any warranty claim, a service fee up to $50 with any additional shipping charges will apply; and any inspection / rejection fees by the relevant authorized service centre may also apply. To start your return procedure, please go to our online request form. Our website is updated frequently to ensure that you'll view the latest products and correct pricing available, and that you receive all of the latest savings. At the time you make a purchase you agree to the listed price and that price are subject to change in some circumstances. These circumstances can occur when stock runs out of a particular product, or when specials ends etc. We are unable to make a price adjustment after an order has been shipped. However, if you notify PureGlare Australia prior to the shipment of your order, we would be happy to make the price adjustment for you. PureGlare reserve the right to make changes and corrections in prices, products and specif	ications without notice due errors arising from misprints, technical and human errors – These changes may affect paid or unpaid orders submitted prior to the corrections being made. All product images on PureGlare Australia website may vary from the actual product. All typographical errors are subject to correction. Please note that images are only to be used as a point of reference. Please be assured that PureGlare Australia make every effort to ensure product description accuracy, however specifications, features, documents and graphics published may contain technical inaccuracies or typographical errors. If an error is made or a product is listed at an incorrect price, PureGlare Australia shall maintain the right to refuse or cancel any orders placed. PureGlare.com.au does not accept any responsibility for errors made by companies such as MyShopping, GetPrice etc who retrieve data from our site and list it on their own. It is the end users responsibility to ensure that what they are ordering is correct. If you have any questions concerning a product please do not hesitate to contact us, please keep in mind we do not refund or exchange for incorrect purchases. We deliver products Australia wide by using StarTrack. Shipping costs are influenced by the size and weight of the product and your location, exact shipping costs are calculated in the shopping cart and will be added to the order total before checkout except free shipping stated on the items. If it's available in PureGlare stock. Orders are dispatched within 2 business days and shipping times are estimated at between 3-7 business days depending on your location within Australia. Orders: An order is not binding upon PureGlare Australia until it is accepted & approved by PureGlare Australia; PureGlare Australia must receive payment before it will accept, approve & process an order. Payment for product(s) ordered is due prior to shipment & back orders (pre-order). (1) Credit Card - 1.8% surcharge applies for VISA and Master cards, 3.7% for American Express, JCB and Diners Club cards. (2) Direct Deposit - It can take 2-3 business days to have the funds cleared. (3) PayPal - 1.8% surchage applies. Please note online orders have not been paid within 10 days will be automatically cancelled. PureGlare is committed to providing exceptional customer service and quality products. We endeavour to make sure that all products listed on our website are currently in stock and pricing is true and correct. Standard delivery timeframes are between 3-14 business days; in the event that an ordered item is not available or we are unable to fulfil your order we will notify you within 2 business days to arrange an agreeable alternative item, a backorder or a full refund. When purchasing from PureGlare your financial details are passed through a secure server using the latest 128-bit SSL (secure sockets layer) encryption technology.128-bit SSL encryption is approximated to take at least one trillion years to break, and is the industry standard. If you have any questions regarding our security policy, please contact our customer support centre service@pureglare.com.au. Any dispute arising out of or related to these Terms and Conditions or the sales transaction between PureGlare Australia and Customer shall be governed by the laws of the State of New South Wales or as defined by the Australian Consumer Law, without regard to its conflicts of law rules. The Customer also agrees not to bring any legal action, based upon any legal theory including contract, tort, and equity or otherwise, against PureGlare Australia that is more than one year after the date of the applicable invoice. These terms and conditions, together with the PureGlare Australia's invoice respecting the products ordered by Customer, are the complete and exclusive agreement between PureGlare Australia and Customer, and they supersede all prior or contemporaneous proposals, oral or written, understandings, representations, conditions, warranties, and all other communications between PureGlare Australia and Customer relating to the subject products. This agreement may not be explained or supplemented by any prior course of dealings or trade by custom or usage. IN ALL CIRCUMSTANCES PureGlare Australia MAXIMUM LIABILITY IS LIMITED TO THE PURCHASE PRICE OF THE PRODUCTS SOLD. PureGlare Australia SHALL NOT, UNDER ANY CIRCUMSTANCES, BE LIABLE UPON A CLAIM OR ACTION IN CONTRACT, TORT, INDEMNIFY OR CONTRIBUTION, OR OTHER CLAIMS RELATING TO THE PRODUCTS IT SELLS WHICH EXCEEDS THIS LIABILITY LIMIT. PureGlare Australia SHALL NOT BE LIABLE FOR THIRD PARTY CLAIMS FOR DAMAGES AGAINST THE CUSTOMER, OR FOR MALFUNTION, DELAYS, INTERRUPTION OF SERVICE, LOSS OF BUSINESS, LOSS OR DAMAGE TO EXEMPLARY DAMAGES, WHETHER OR NOT PureGlare Australia IS APPRIASED OF THE POSSIBILITY OF SUCH CLAIMS OR DAMAGES.